Habit: Annual 10--40 cm, erect, slender. Stem: branches 0 to throughout; strigose to rough-hairy, hairs appressed to occasionally spreading. Leaf: few, 0.5--3 cm, linear to narrow-lanceolate; hairs generally appressed to +- spreading, minute-bulbous-based. Inflorescence: in (1s) 2s (3s); bracts 0; pedicel +- 0. Flower: calyx 2--2.5 mm, 3--4 mm in fruit, tightly constricted above, deciduous, lobes lance-linear, tips generally spreading to recurved, dense-rough-hairy to coarse-bristly, hairs ascending to spreading, midvein thickened; corolla limb 1--1.5 mm diam, appendages 0. Fruit: nutlets 1(2), 2.3--2.7 mm, lance-ovate, brown, fine-grainy, +- white-papillate, +- dull, margin rounded, base rounded, tip beaked; abaxially rounded, ridge 0; adaxially flat to low-biconvex, attachment scar edges +- raised, abutted to gapped entire length, triangular-flare-gapped at base; axis not to nutlet tips. 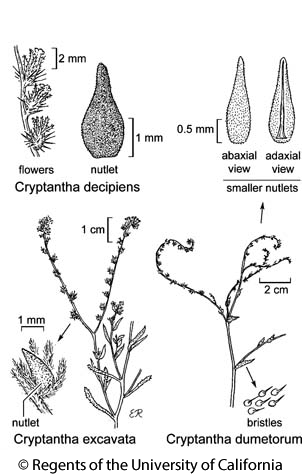 Citation for this treatment: Ronald B. Kelley, Michael G. Simpson & Kristen E. Hasenstab-Lehman 2012, Cryptantha decipiens, in Jepson Flora Project (eds.) Jepson eFlora, http://ucjeps.berkeley.edu/eflora/eflora_display.php?tid=21221, accessed on April 21, 2019.
se SNH, Teh, SnJV, SnFrB, SCoR, ne SCo, WTR, n SnGb, ne SnBr, e PR, W&I, D; Markers link to CCH specimen records. Yellow markers indicate records that may provide evidence for eFlora range revision or may have georeferencing or identification issues. Purple markers indicate specimens collected from a garden, greenhouse, or other non-wild location.